It sometimes feels like social media is one big race; everyone’s trying to gain the most followers, likes and comments in the fastest time possible. Social media provides an excellent opportunity to learn about your customers, expand your business and stay connected to the community. It doesn’t matter whether you’re an international corporation, a local business or a freelance artist. Taking advantage of the benefits of social media can be exceptionally rewarding. Many people, though, can find it hard to grow their following and engagement. That’s where exposure comes in to play. 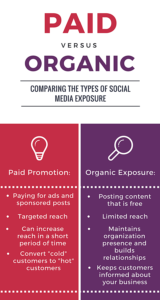 Organic exposure is when you provide content on social media without paying for it, such as posts to your own feed, shares and comments. Paid exposure requires a monetary investment for items such as ads and sponsored posts. In terms of our race, paid exposure is similar to a series of 100-meter dashes. You pay for an ad or sponsored content targeting specific audiences that, if done correctly, provides a quick boost to your numbers. Once that ad has accomplished its goal, a strong social media strategy will retarget the audience (another sprint) to move them along the sales funnel. One benefit to paid exposure? 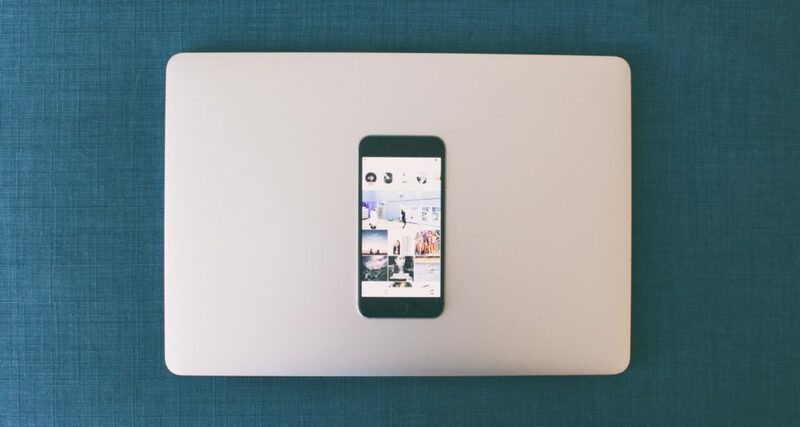 Paid promotion helps to connect you with people that are already interested in your expertise but may not be following you yet. For example, if you’re a sports retailer, taking advantage of paid ads on social media means that sports fans (identified by their online activity) are more likely to see your ad than someone who doesn’t know that LeBron signed with the Lakers. This can drive an increase of traffic to your social media accounts and website. Paid promotion can also reach new customers and provide them with incentive to take action. With ad buys and strategic marketing, your customer base can grow exponentially. Organic exposure is akin to the cross-country marathon. It takes time, effort and creativity. Posting creative, relevant content on a regular basis will help to build a relationship with your customers, further brand imaging and distribute information about your business. Organic engagement, however, often lacks a broad reach, especially in today’s social media climate. Facebook, Twitter, Instagram and Linkedin have all changed their newsfeed algorithms recently. This means that users’ feeds show content based on who they already follow and who they interact with using likes and comments. With this change, businesses can’t rely on just posting content regularly to drive traffic. So what’s the best tactic to increase followers and engagement? Paid and organic exposure work best when done together. It’s difficult to gain results by utilizing just one tactic. Start by establishing a reliable organic strategy. Post regularly, interact with followers (or non-followers relevant to your business) and follow others. Then try a paid strategy for a boost in followers and engagement. Make sure to research your target demographic and test varying ad durations, copy and target segments to find the right fit. But never forget to stay consistent with your postings and interaction. Slow and steady (with a few well-placed paid slots) wins the race. Are you looking for an award-winning social media campaign? Drop us a line! Written by intern Yasmine Evans, a senior at NC State University. ← Why Hire A PR Agency?